After some persuasion by colleague Patrick Sansom I presented the 3 Tribes Experiment at UX Camp Brighton 2017, an annual event full of shared learning and fun. This year there were five rooms that offered a choice of presenters and subjects covering diverse topics as user experience, user research, lean coffee discussion on design sprints, to Chris How’s memorable Machiavellian masterclass in manipulation and Richard Vahrman’s wearable musical interfaces. Something for everyone. It’s well worth spending a day there immersed in current thinking and practice and opportunity to meet some impressive people. Sessions are all time boxed so each slot is focused but still offers plenty of audience participation and interaction as you would expect for such an event. My 3 Tribes experiment examines the link between personality and empathy that can influence the way we think about solving problems. It’s been rattling around in my mind for a while and UX Camp was an opportunity to test the theory. 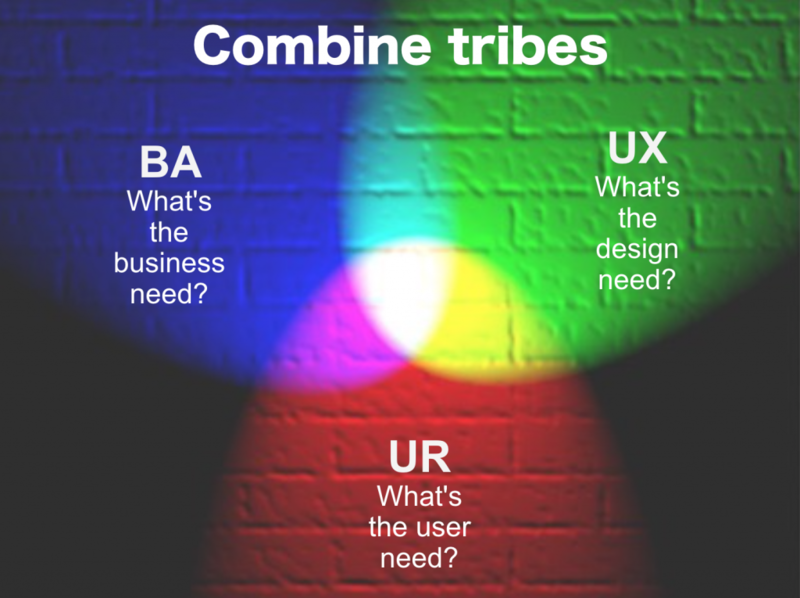 The slides I used together with the experiment results are available to download here UXCamp-3Tribes. The experiment began by asking all participants to choose one of three questions they most identified with and take a red, green or blue sticky to remember their choice. Each question is based on a Myres Briggs personality test and selected to distinguish a participant’s empathy. As you will see from the slides the questions were never intended to provide an accurate determination of personality but would at least give some segregation. Next the participants were set a challenge of improving a well known end user experience problem, that of the ‘Unexpected item in the bagging area’. I asked everyone to think about their ideas individually at first so they would not be biased by others. The silence was deafening and after a long minute I let them group into their tribes to discuss ideas. Think around 20 attended and 15 participants returned results for the experiment. To my surprise, the results show a significant correlation between expected empathy and improvement approach taken for design and business process. All participants that chose a blue tribe sticky responded with a business needs empathy. And participants that chose a green tribe sticky responded with a design needs empathy with one also voting ‘half’ for user needs. Two thirds of participants that chose a red tribe sticky responded with a user needs empathy. Caveat – participants agreed their user empathy was biased by their past experience as customers. Each participant determined their empathy based on the examples I demonstrated after we’d discussed a few improvements from each tribe. I’m sure psychologists would find many mistakes in my amateur experiment and point out bias was inevitable but I do find the results interesting and hope you do too. UX Camp offered several speakers with similar themes including Leo Barnes and Mark McElhaw’s Mindstates which I’ll be finding out more about.